Dark Angael is a 2D run-and-gun platform game with a mystical fantasy theme. 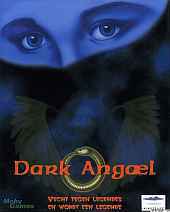 In this game you play as Carina, the Dark Angael. Thanks to Azrael the world has been plunged in total chaos and the end is near. It is up to you to defeat Azrael and his army of demons. Carina has to fend off the demon's with the various weapons she finds or she can rely on her superpowers. Carina can come into the possession of five super powers that increase her combat abilities. These super powers are the Mutator which allows you to transform medkits into ammo and vice versa, Psychic Attack for maximum damage, Reflection to reflect enemy lasers, Teleport Coin to teleport directly to where you throw it, and Energy Wave that damages all enemies near you. Along the way the player will meet various NPCs with whom he can talk lengthy dialogues. This is necessary to find passages in the levels that lead to hidden worlds. Carina can move and jump using the keyboard and you aim her weapons with the mouse. Multi-player modes include Death Match.